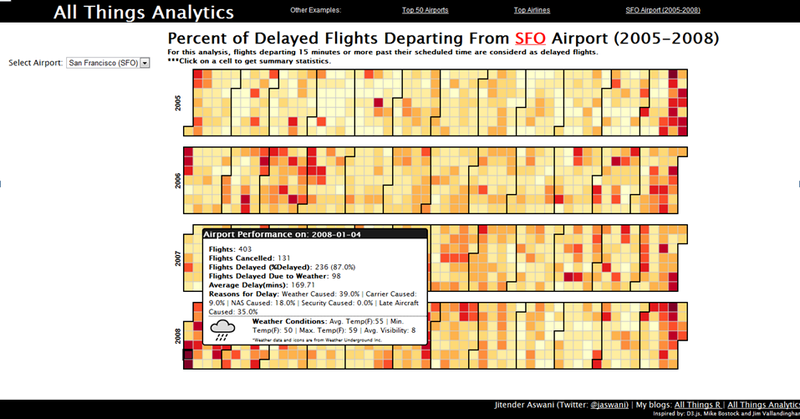 In this blog, I wanted to mash-up disparate data sources in R and HANA by combining airlines data with weather data to understand the reasons behind the airport/airlines delay. Why weather – because weather is one of the commonly cited reasons in the airlines industry for flight delays. Fortunately, the airlines data breaks up the delay by weather, security, late aircraft etc., so weather related delays can be isolated and then the actual weather data can be mashed-up to validate the airlines’ claims. However, I will not be doing this here, I will just be displaying the mashed-up data. Click here to interact with the live example. Hover over any cell in the live example and a tool tip with comprehensive analytics will show the break down of the performance delay for the selected cell including weather data and correct icons* – result of a mash-up. Choose a different airport from the drop-down to change the performance calendar. * Weather icons are properties of Weather Underground. As anticipated, SFO airport had more red on the calendar than SJC and OAK. SJC definitely is the best performing airport in the bay-area. Contrary to my expectation, weather didn’t cause as much havoc on SFO as one would expect, strange? Creating a mash-up in R for these two data-sets was super easy and a CSV output was produced to work with HTML5/D3. Here is the R code and if it not clear from all my previous blogs: I just love data.table package. # You have now (Airportcode, JSONString), Once again, you need to attach them together. To leave a comment for the author, please follow the link and comment on their blog: All Things R.